Students discovering the joys of reading. Photos: Supplied. Teachers struggling to help students with their reading need only look at 16 Indigenous students at Queanbeyan South Public School who have set a new benchmark for improving their reading. Now, the national project is looking to help more pupils in Canberra and the surrounding region. Indigenous Reading Project chief executive Dan Billing says the children’s results in 2018 were excellent. “They were some of the most impressive increases in time spent reading that we have seen in the history of the program,” Mr Billing said. 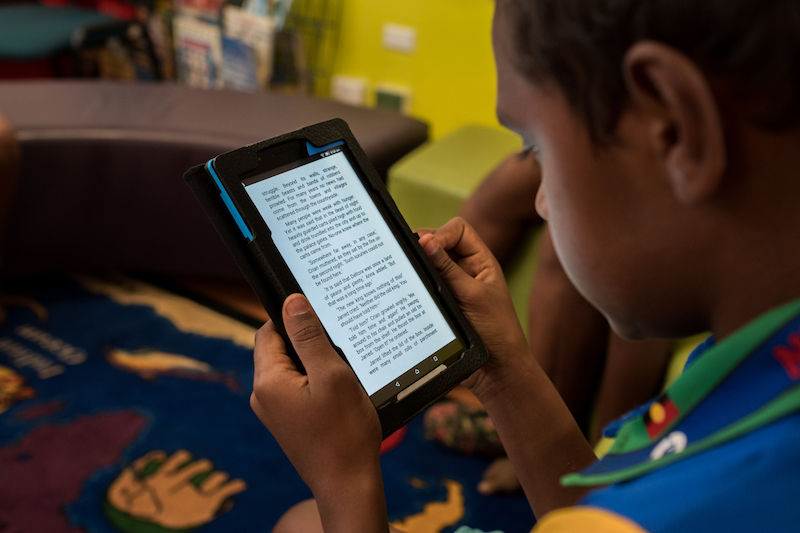 IRP uses digital technology to improve the reading ability of Indigenous children. They loan students tablets and give them access to a cloud library to browse through and borrow e-books that interest them and match their reading ability. Students who make a measurable improvement are rewarded with the tablet. More than 150 students were helped in 2018 throughout Australia. 2018 showed some of the best results for the reading program. The Queanbeyan students were the biggest cohort from a single school since the learning initiative began. “We had great support from the school leadership and staff, as well as the children and parents. It was a whole-of-community commitment. When you get that sort of support and buy-in, a commitment to working with us, that’s when some of the magic can happen,” Mr Billing says. Instead of looking for government support, IRP connects with organisations with a business and social mission that aligns with theirs. Professional services firm Rubik3 donated $20,000 in 2018. The award-winning firm also does book-keeping for IRP, freeing it up to focus on its services. Rubik3 also provides strategic advice. “All those things are really valuable for us,” Mr Billing says. A highlight for Ms Pessarossi is working with and supporting Dan Billing. “The values and commitment that IRP have for Indigenous kids and their education aligns with Rubik’s values and commitment to improving children’s lives. We are excited to see even more success for 2019 and highly encourage schools to help these kids and apply for the IRP Grant,” Ms Pessarossi said. Mr Billing says children who are behind in their reading, below the national average, who have solid support at school and at home and are interested and motivated to improve their reading ability should apply for IRP support.“Teachers can tell us about the student, what they bring to the classroom each day and they can also give us key information about the student’s reading ability and likelihood of them being able to adjust to our model. The 2019 intake for student nominations is now open. To apply, click here and follow the link.